At High Adventure Ranch, we cater to whatever needs you may have. 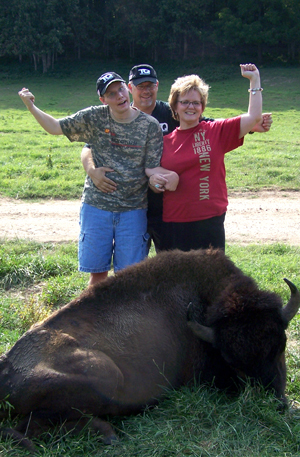 Whether you are handicapped and in a wheelchair and need to hunt from one of our Four Wheel drive pickups or perhaps you can only walk short distances, our experienced guides will assist you out in the hunting field to insure you get that trophy animal of a lifetime or perhaps fill your freezer with venison. 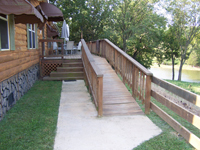 Both our Lodge and one of our Cabins have ramps for easy wheelchair access. The Master Bedroom’s Bathroom in the Lodge has recently been updated that features a door that has wheelchair accessibility, raised sink, toilet, and walk in shower with hand rails and seat. At High Adventure Ranch we treat everyone the same, from the 6 year old child hunting for the first time to a handicapped hunter in a wheelchair to an experienced 92 year old hunter. We believe in making memories that will last a lifetime! For more information on our options for Hunts for Handicapped Individuals, please call (314) 209-9800 or fill our our contact form.